What people do in Bangkok? Most people have a floating market on their ‘To Do’ list when visiting Thailand, especially Bangkok. While the most well known floating market is Damnoen Saduk, it has become overrun with tourists and scammers. For a more authentic floating market experience, the Amphawa Floating Market is your best bet. The Amphawa Floating Market is located about 1.5 – 2 hours away from Bangkok depending on the traffic. Although it is technically open all week, it really comes alive on the weekends when local Thai people from Bangkok flock there for a bit of shopping and fresh seafood. I visited on a Sunday afternoon and was not at all disappointed by my experience. It turned out to be a great affordable day trip to escape the city (though not the crowds!). 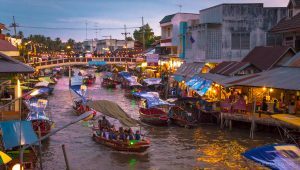 There is plenty to see and do at the Amphawa Floating Market. Of course, I wandered along the canal where many shops are set up selling all kinds of things such as Amphawa souvenirs, clothing, food, and sweets. The market is not limited to the canal though, and stretches up side streets all around the town. In addition to shopping, you can also get a classic Thai massage, including one on a boat! For vans to Amphawa, you must travel to the Southern Bus Terminal (สถานีขนส่งสายใต้ใหม่) across the river, most easily reached by taxi. The city is providing shuttle buses from Victory Monument for the time being to the three bus stations. They cost between 90 – 100 baht each way (I paid 90 on the way down and 100 on the way back) and drop you right down the street from the market. Buses run frequently from Victory Monument starting early in the morning. There is no real rush to get there super early, unless you do not like crowds, as the market really comes alive in the afternoon, around 15:00 (3:00 PM). I recommend buying your return ticket to Bangkok right when you arrive in Amphawa. The staff at the mini bus station will ask what time you would like to head back (buses leave every hour, on the hour) with the last bus leaving at 21:00 (9:00 PM). Getting your ticket ahead of time will ensure a spot, as the staff will write down the time and number of people in your party to expect. This entry was posted in Uncategorized and tagged floating market on February 20, 2017 by Evan.